We're keeping the Dungeon Drops and weekend giveaways going to help everyone get ready for the chaos to come in November! 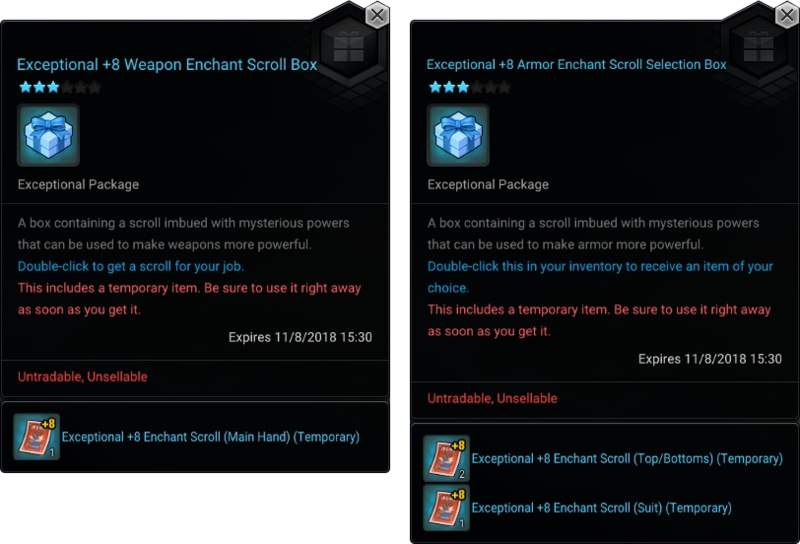 Get +8 Enchant Scrolls for your weapon and gear, 400 Red Merets and another week of Double Dungeon Drops from Normal Adventure Dungeons! Double Dungeon Drop: Get two rolls on the loot table with every Normal Adventure Dungeon you complete! Event applies to all levels and in all Normal Adventure Dungeons. Get geared for Hard Adventure Dungeons twice as fast! Saturday and Sunday Giveaways: 2x 100 Red Meret Pouches each day! Note: European Maplers, make sure you check your clocks, Daylight Savings ends in the Central Europe time zone on Sunday, October 28th at 2:00 AM!